n last few months we have had the pleasure of hosting on our Instagram profile, the “crazy knitter” Laura Baresi, with whom we have been collaborating for a long time, for a series of “Takeovers”, stories with fun and super useful Crochet Tutorial and Knitting Tutorials. Have you alread watched Bettaknit channel on YouTube? If you haven’t seen it yet, go and take a look! There are many video tutorials about basic crochet stitches (and knitting stitches and muc more! ), all very clear and very helpful for beginners. 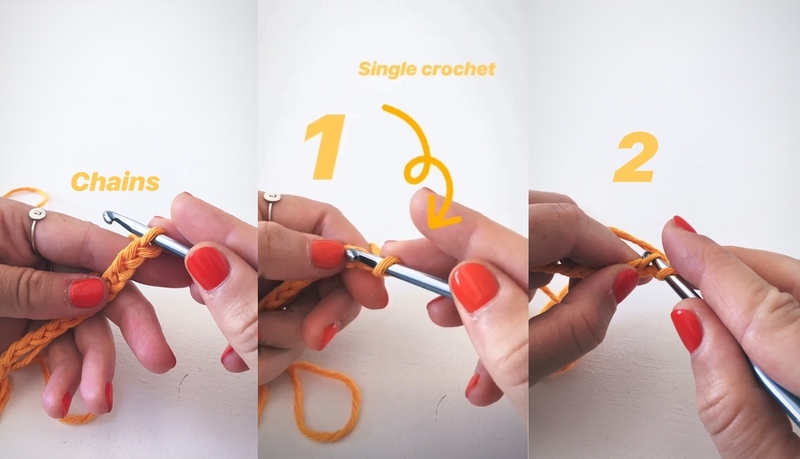 But we felt the need to create non-conventional Tutorials, to reach the new “millenial knitters”, that is the new generation of knitters always connected to the smartphone. Laura Baresi has therefore created Stories for our Instagram profile, a sort of “prêt à voir” Tutorials, to be looked quickly everywhere, while “fiddling” with the phone! Crazy Tutorials, are a series of images, which follow one after the other, almost to create a video, which retraces the basic stitches of crochet and knitting, in a very simple and immediate way. The first Story, about the slip knot and chain, can be found as “Stories Highlights” on Instragam and for any more traditional review, I refer you to this old blog post. Firstly, make a fondation chain (like that), lenght as you like. 1 – Then, insert the crochet hook into the middle of the second stitch from hook. (Double Crochet uses a turning chain of 1 stitch, which is why you skip the first stitch of your foundation chain). 2 – Now, yarn over hook (move the hook under, then over the yarn (yarn will remain on the back of the crochet rod). 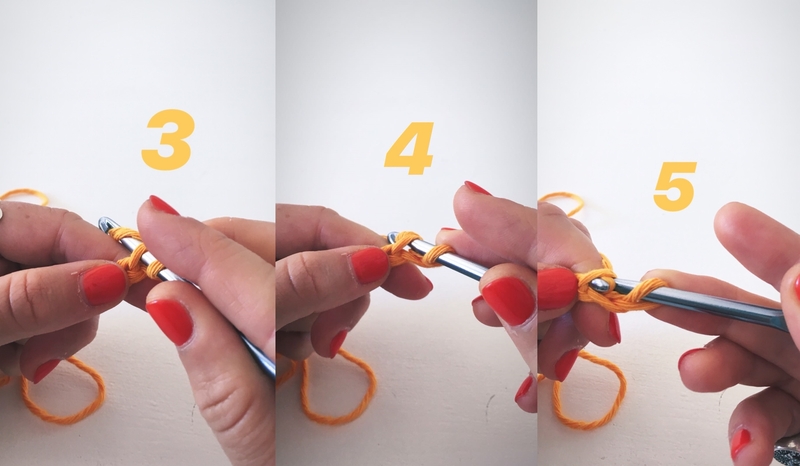 3 – Scoop up the yarn with the groove of your hook. 4 -5 – Pull the yarn through the chain. 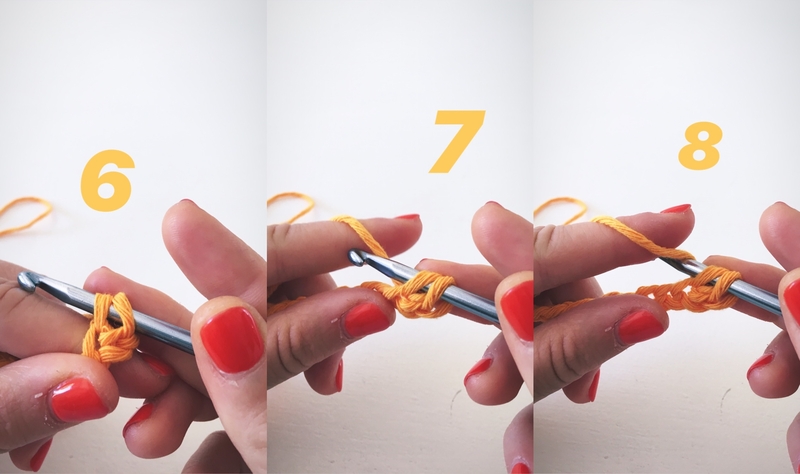 6 – There are now both the loop and the yarn on your hook (you will have two loops on your hook). 7 – 8 – Again, yarn over hook. 9 – Yarn will remain on the back of the crochet rod. 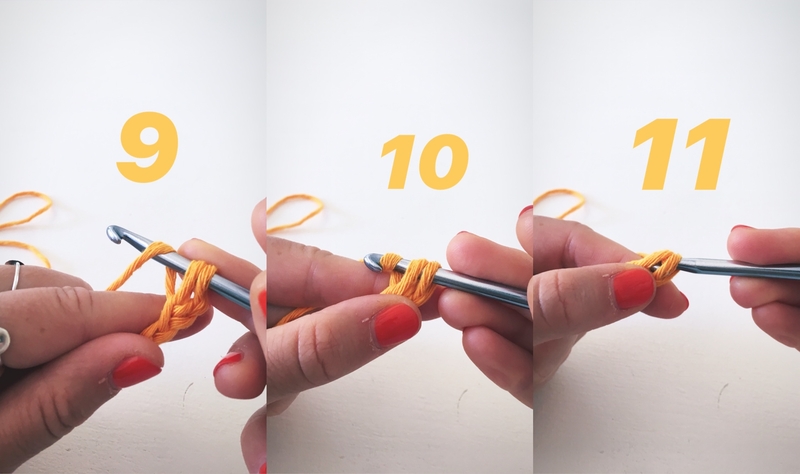 10 – Scoop up the yarn with the groove of your hook. 11 – Pull the yarn through the loops. 12 – Finally, pull the yarn through both the loops on the hook. 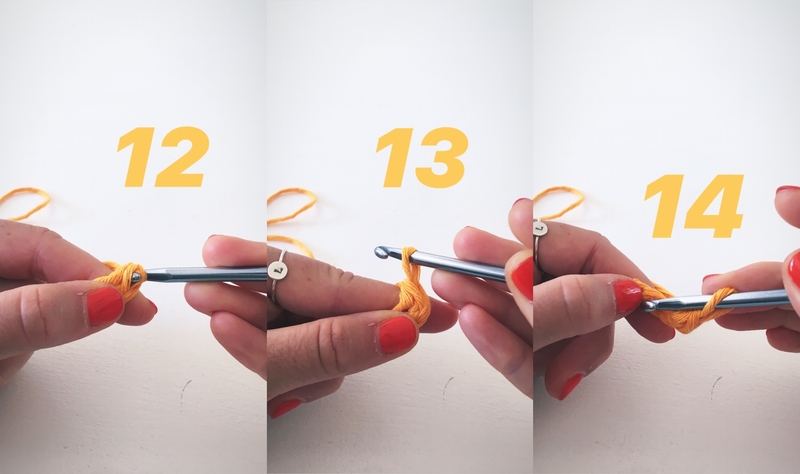 13 – As a result, you’ll have one single loop: you have thus crocheted your first Double Crochet! 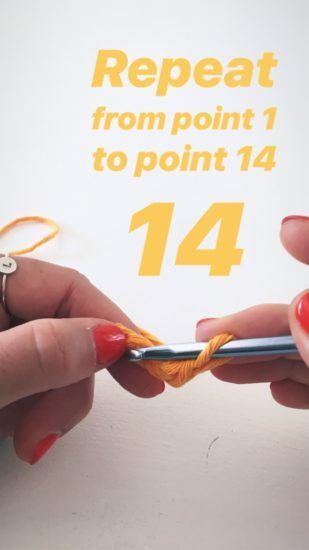 14 – Insert the hook in to the next chain to make a new Double Crochet. Keep working in this way until you the end of row (that is for all the foundation chains), inserting the crochet hook into each further chain (repeat steps 2 to 14). You have learned how to make Double Crochet: it’s a very easy basic stitch that certailnly will allow you to realize many projects! Take a look at the Crochet Kits on our store and test yourself! Probably you’ll be shy, but we would like to see your progress, therefore no fear! Share your work on Intagram with the hashtags #bettaknit and #ilovebettaknit!